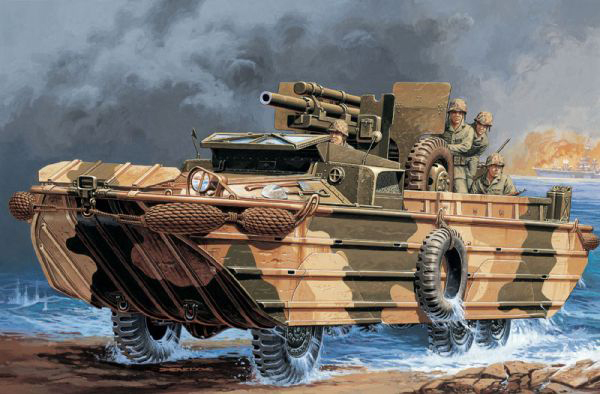 The GMC DUKW (“D” – year 1942, “U” – utility, “K” – all-wheel drive, “W” – twin rear axles) was soon colloquially known as the “duck” to both US Army and Marine infantrymen. This strange vehicle was massively produced and soldiered all around the globe, from the Mediterranean to Europe, Russia, the Pacific and the Far East. 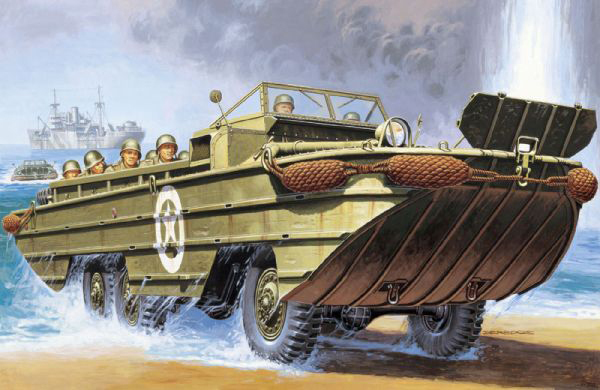 This was the only wheeled amphibious vehicle serving in such numbers on the Allied side. They are still used to this day, either for training or in civilian uses. The first lines of the DUWK were drawn by Rod Stephens Jr., a yacht designer from Sparkman & Stephens, Inc., a British deep water sailor resident in the U.S., Dennis Puleston, and a Reserve Officer detached from the Massachusetts Institute of Technology, Frank W. Speir. At that time there wasn’t any immediate need for such a vehicle, as the USA still uninvolved in the war. The project was developed by the National Defense Research Committee and the Office of Scientific Research and Development. GMC was then charged with building the vehicle, using any available components. General Motors Corporation (GMC) sought the most appropriate vehicle to meet the requirements laid down. 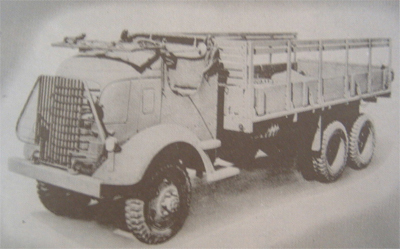 The GMC ACKWX, a cab-over-engine (COE) special version of the CCKW six-wheel-drive military truck, also later popularly known as 2-ton utility “Deuce”, was chosen. This allowed commonality with an already produced vehicle, using the power plant, transmission, transfer case, drive shafts, axles and brake system, with easy maintenance prospects. A steel sheet watertight hull was welded around the chassis, strengthened with reinforcements beams. The hull was rectangular, with a curved bow, sloped ends and a flat bottom. The bow and stern shapes were determined by the angles of approach and departure. Around 1/3 of the vehicle was occupied by the engine, a 270 cu in (4,425 cc) GMC straight-six engine giving 64 hp (47.74 kW) and a lot of torque. Transmission used a 10-forward speed, two reverse gearbox. Behind the engine was the open-top driver compartment. The last two-thirds of the hull were occupied by a large utility cargo area. Usual payload was 2 1/2 tons over land or water. The versatile cargo compartment could be covered by a tarpaulin cover. The driver compartment, made of plywood, was protected by a windglass designed by Henry Gassaway, working for Libbey Glass (Ford), to withstand excessive vibrations. At his left, a space could be used for a ring mount, holding a heavy machine-gun (0.5 cal/12.7 mm). The hull was light and unarmored (3.2 mm/0.12 in at the thickest). The cooling system was somewhat unusual in that air was drawn from behind the driver, pushed through the radiator and exhausted on each side. Nearly 50 different combinations of radiators, fans and ducts were tried before finding the optimal solution. There was also a complex and powerful heating system, to avoid water freezing in the bilge or in the bilge pumps. By using well-placed shutters on the engine outlets, warmed exhaust air was recirculated into the hull sides, decks, cargo compartments and even below the floor to warm the bilge. This vehicle was fast on road, with a maximum speed of 80 km/h (50 mph), but could still cruise at 5.5 knots (6.33 mph/10.2 km/h), the speed of most barges, for long cruises, up to 50 nautical miles (58 miles/93 km). This was later proven to be enough to cross the English channel without difficulty, also demonstrating its seaworthiness. There was a duplex drive system, with a long transmission shaft acting a screw propeller housed in a tunnel at the rear end of the hull, and steered by removable rudders. There were two other innovations specific to the model. One was the fitting of a high capacity bilge pump system (total capacity of approximately 300 gallons/1135 liters per minute) if the hull was breached or submerged by rough seas. The second was Speir’s device, an internal system allowing to vary the tire pressure from the dashboard, which was useful when trying to deal with soft or hard ground (in the first case, pressure was decreased to provide a larger tire surface in contact -and lessen ground pressure). This was extremely helpful when it was required to land on sandy beaches. Yellow Truck and Coach at Pontiac was charged with building the prototype, and refined the construction details. The prototype built by GMC was eventually demonstrated to a military commission. The initial proposal was immediately rejected by the Army, but the team later choose a particularly difficult spot because of high winds and heavy surf, at Provincetown, Massachusetts, rescuing the entire crew of a Coast Guard Cutter in distress and safely carrying them to the beach. 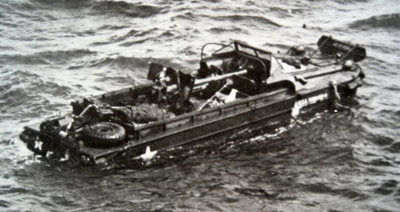 The DUKW performed admirably, whereas any conventional solution would have failed. Some officers changed their mind, and authorized the production for internal needs (mostly the US Marine Corps now involved in the Pacific), and the Allies through Lend-Lease. Eventually, 21,137 were produced by GMC and its subcontractors, the bulk being absorbed by the US forces, and around 4,000 sent to the Allies. Production started at the end of 1942 and lasted until the end of the hostilities. Unit cost was $10,750.00 dollars apiece. 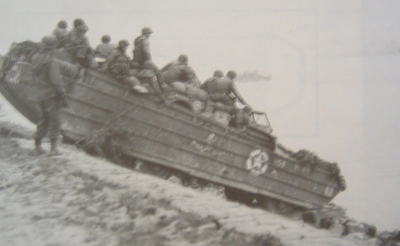 The DUKW first arrived to units -both in the Pacific and Europe- in early 1943. Its first action came with Operation Husky (invasion of Sicily, November 1943). It was also seen during D-Day, where 2000 were committed in action, carrying personnel and 3,040,000 tons of supplies ashore during 90 days of uninterrupted service, Operation Anvil-Dragoon. Other notable operations include the landings in the south of France, the Battle of the Scheldt – the capture of Antwerp, Operation Veritable – the battle of the Reichswald, north-western Holland, and Operation Plunder – the crossing of the Rhine. The Canadians were largely involved in these operations, having received approximately 800 of these. The British forces received around 2000 of these and the Australians fighting in New Guinea, 535. The Soviet Union also received 589 of them, for river fording operations and in the marshy Pripet area. The Free French also operated many DUKWs during operation Anvil Dragoon (landings in Provence) and later on. The DUKWs were found vital in most submerged or (voluntary) inundated areas, in Holland and western Germany. In the Pacific, the first commitment came with the USMC reinforcements at Guadalcanal. Although tracked amphibious vehicles were often preferred, DUKWs were massively employed during nearly all island assaults conducted until the end of the war, and the whole Philippines campaign. Usually they were cargo-borne, like any landing craft, but with the enormous advantage of being able to properly land. Only their lack of protection prevented their use in the first waves, as they were often relegated to ferry supplies instead of assault troops, including heavy ones, like 105 mm (4.13 in) howitzers. Some were used as ad hoc SPGs, delivering fire support in various operations, despite the fact that the recoil largely stressed the thin hull and chassis. Some versions mounted 100+ 4.5″ rockets. Other were used as naval ambulances, ferrying wounded soldiers to the hospital ships nearby. 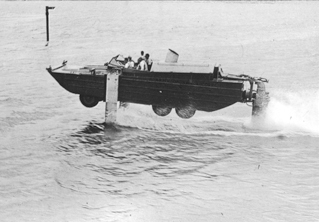 In all cases, the DUKW demonstrated a remarkable reliability and versatility in all situations. Tactically the British deployed their DUKWs in RASC companies comprising 470 men on 132 vehicles. 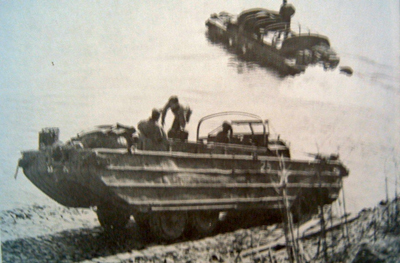 Australian DUKW companies comprised 173 men and officers for 50 vehicles. Ideal crew strength was found to be four men. The DUKW’s postwar influence can’t be underestimated. Some “super DUKWs” were conceived in the fifties, the Drake and the BARC (later known as LARC-LX), and the LARCs, sometimes mislabeled as “DUKWs”. The Soviets made their own version, the BAV 485, produced in large numbers until 1962. Existing stocks were spread among Allied nations, and some are still in service today. The French largely used it in Indochina. Some saw action in Korea and Vietnam. Surplus vehicles were also sold to private owners for collection or transportation. Some serve to this day as “Duck Tours”, carrying amazed tourists in London, Dublin and elsewhere. DUKW during operation Anvil Dragoon, French Riviera, August 1944. Notice the low roadwheel covers. The vehicle had its wave deflector unfolded. 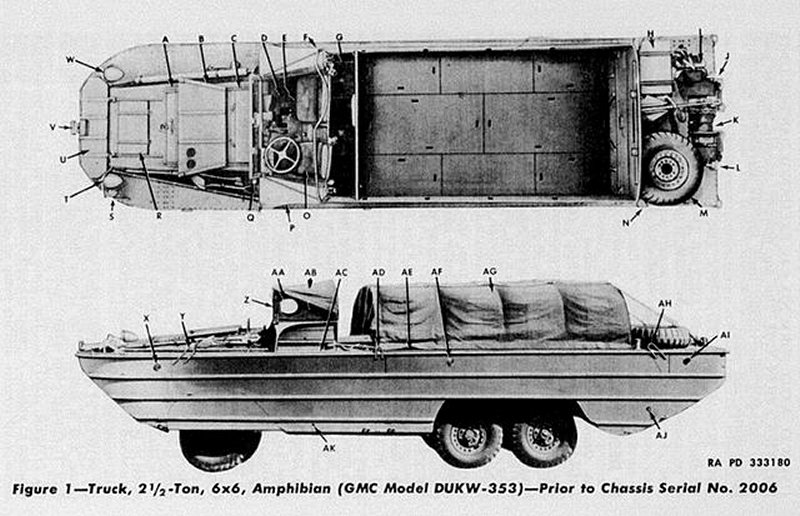 DUKW with tarpaulin over both the driver\’s compartment and the cargo bay. A DUKW carrying a M3 75 mm (2.95 in) gun, Normandy 1944. 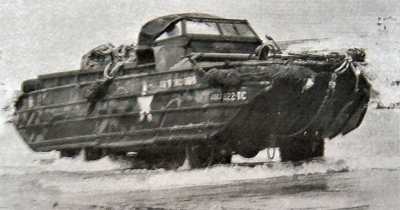 A DUKW carrying a 75 mm (2.95 in) M1 pack howitzer, with the standard 0.5 cal (12.7 mm) M1920 heavy machine gun ring mount. Unknown Allied unit, Sicily, fall 1943. A Soviet Lend-Lease DUKW in Eastern Prussia, with Konstantin Rokossovsky\’s 2nd Belorussian Front, January 1945. USMC DUKW Company at Iwo Jima, “Joan Molley”, February 1945. Thank’s a lot for your website! Eric and Claude – DUKW Owner – Keep them rolling! You’re very welcome, and we’ll have more coming every week! I was a DUKW driver in Viet Nam in 67-68 . Was in Beachmasters Unit 1. made 4 operation to . The life expectancy of a Beachmaster was 7 sec. not even a bull ride. That value seems awfully small, to the point of it being unbelievable. How was this life expectancy measured? Do you have any sources for that?